New legislation that extends free personal care in Scotland to under-65s has come into effect. Frank's Law was the result of a successful campaign by Amanda Kopel, which began with a petition to MSPs at Scottish Parliament in 2013. 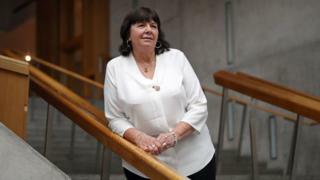 Her husband Frank Kopel - the former Dundee United footballer - had been diagnosed with dementia at 59. He was too young to qualify for free care. So Mrs Kopel set out to ensure anyone living with disabilities and degenerative conditions could access support, regardless of age. The new law is a reminder of how powerful Holyrood's petitions process can be. Mrs Kopel believed the existing law was discriminatory. Personal and nursing care has been free for older people in Scotland since 1 July 2002, under the Community Care and Health (Scotland) Act. But this also meant anyone under 65 could be charged for the same services. Dementia "is no respecter of age, creed or colour or how much money you have in your bank account," Mrs Kopel told the petitions committee when she first gave evidence in September 2013. In the later stages of her husband Frank's life, they had to pay nearly £350 per month for support. She said this equated to around 45 minutes of personal care each day. The Kopel's compelling story encouraged the petitions committee at Holyrood to pursue the matter further. The campaign for Frank's Law kept building. Between 2013 and 2015, the petitions committee was continually in contact with the Scottish government and Cosla (the umbrella body for councils) about care charges. During this time, Frank Kopel died, just 19 days after his 65th birthday. But Mrs Kopel continued to pursue her campaign. In October 2015, then Health Secretary Shona Robison appeared before the committee. She backed a "fairer charging system" - but did not go as far as backing the petition. In a letter to the committee the next month, Mrs Kopel said: "People ask me why I am still fighting to have Frank's Law introduced? "Well, I have walked in these people's shoes, and I know what it is like for them and their families to be blatantly discriminated against because of the age on their birth certificate." When the Scottish Parliament dissolved ahead of the 2016 elections, MSPs on the petitions committee recommended that its successor pick up the baton. Labour MSP Johann Lamont was elected as convener of the new petitions committee in June 2016. She would later lodge a motion in parliament highlighting calls for social care charging to end. This was debated in December 2016, with Labour, Conservative and Green MSPs backing the Frank's Law campaign. The Scottish government confirmed it was undertaking a feasibility study on expanding free personal care the month before. With the Scottish government still pondering its feasibility study, Tory MSP Miles Briggs launched a member's bill. Such bills enable any MSP to create legislation. The proposed Free Personal Care (Persons under 65) (Scotland) Bill opened for consultation at the end of June 2017. Since it had the backing of all four opposition parties, it would likely have passed regardless of the SNP's position. But this was a moot point. First Minister Nicola Sturgeon announced in her programme for government 2017-18 that the government would expand free personal care. Mrs Kopel said she was ecstatic about the decision. "Somewhere along the line I kept thinking that Frank's Law is a battle that is winnable," she told BBC Scotland at the time. "Yes there were some really rough days - days when I felt like just giving up and thinking I can't go on with this anymore because I kept getting knocked down. "But so many people have been beside me." And now? Mrs Kopel is looking forward to seeing the policy rolled out across the country. However, with some campaigners concerned fewer people will benefit from the new legislation than should, she also sends a warning. She told BBC Scotland: "It's vitally important that they get it right, because if they don't it's just going to make a total mockery of Frank's Law. "And it'll make all that last six years go right out the window." The Scottish government says about 10,000 people will be entitled to free personal care and it will ensure people are treated equally regardless of their age. Petition wins: What other campaigns have done well? Petitions on mesh implants, LGBT education and free music tuition have all been brought to Holyrood in recent years and enjoyed varying degrees of success. The Scottish Mesh Survivors group celebrated last September when the Scottish government ordered health boards to halt the of use mesh implants. Like Frank's Law, the campaign was a long-running one and was not without its drama. Women who suffered "life-changing side effects" from mesh implants gave "heartbreaking" evidence to the petitions committee in 2014, which led to a suspension of the procedure in all but "exceptional circumstances". Despite this, many women were still offered mesh implants and a review into them was branded a whitewash by the same women who brought the petition. September's announcement saw a "high vigilance restricted-use protocol" put in place. The Time for Inclusive Education (TIE) campaign made its first bid to put LGBT issues on the school curriculum back in August 2015. But after gathering some evidence from stakeholders, the petition committee opted to close it just five months later because the aims of the petition were "not supported by stakeholders". Fast forward almost three years and Education Secretary John Swinney announced that schools would recognise the issues faced by the LGBT community as part of the curriculum. What changed? Jordan Daly and Liam Stevenson of TIE continued to campaign on the issue which led to the creation of the LGBT Inclusive Education Working Group. Despite an early set-back and the petition itself not being successful, the campaign made a difference. And those behind other petitions are still hopeful of making an impact. The Change the Tune campaign supporting free music lessons in schools - still ongoing - recently cleared a hurdle when the education committee backed free tuition for all. A petition was lodged by Ralph Riddiough in June 2018. He says: "I think the time was right for a petition on musical instrument tuition as there has been a head of steam building on this issue for several years." But his work is not yet done. He adds: "The report from the education and skills committee was very supportive and, with some of the conclusions of that report, I am moving now into a legal process to try and force an outcome."